This is a special place for us. ... and ends four years later on a day in May. For us it was May 26, 1999. 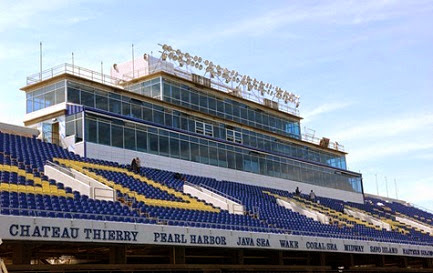 Those "Four Years by the Bay" are a grueling physical and mental building experience for the midshipmen, not to be appreciated for some period of years after. But they are four years of interesting, fun experiences for the parents. We parents have a different set of memories of those years. The class of '99 had the big reunion tent at the stadium for today and that was the scene of the action all day. Adam, Amy, and the boys left the hotel before us and went to the reunion tent for pre–game activities. Michelle and I went later to the stadium. We haven't been there since graduation day fifteen years ago. I'm not an expert on football stadiums, so I won't throw out statistics to try to prove this is the biggest and best stadium ever built; it's not. But today, just like every other time I've entered this place, I got a lump in my throat as I read the names of the places where so much bravery was shown and so much blood was spilled for this country. No other stadium can do that. It was a beautiful day for football and there was a football game but few paid attention. 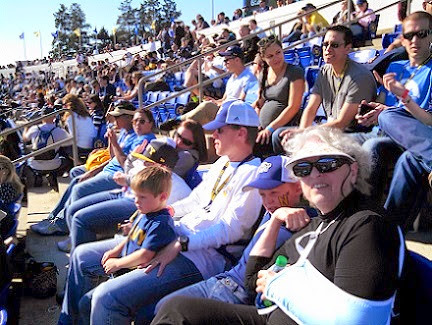 Navy beat San Jose State 41-31. We joined up at the reunion tent after the football game but we were 5th wheels at the party. The handsome young ladies and gentlemen who had thrown their caps in the air fifteen years ago are now middle–aged folks dragging a string of kids behind them. They were intent on trading life stories and not paying attention to us aging parents. Our job was to corral the kids and we were happy to do that. 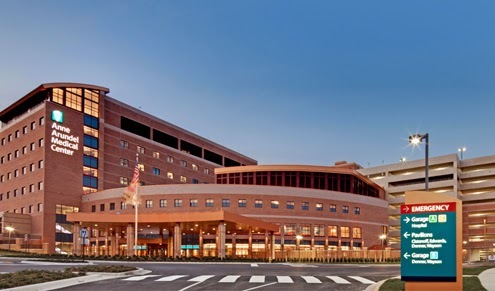 This evening we changed hotels; relocating close to Baltimore-Washington International Airport in preparation for the morning departure for Denver. This adventure is about over. Our first event of the day was a family reunion at the Double T Diner in Parole, MD – a western suburb of Annapolis. and breakfast is beyond belief. Jean and Mary Morais are the widow and daughter of Michelle's deceased brother Gerry. Michelle and Jean keep in touch regularly by phone but it has been a long time since Jean and Mary have seen Adam and family. In fact they have never seen Ben who is now five years old. 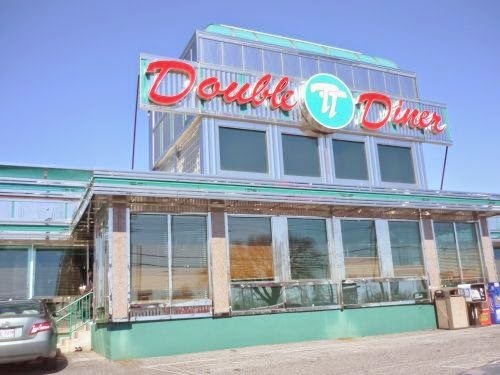 The Double T Diner is huge – way beyond any visualization of a diner. They easily accommodated us at a table for ten. Our breakfast lasted over two hours as we all caught up on life and memories. We left a BIG tip. I must add that three young gentlemen were able to sit still and tolerate boring adult talk for two hours. That was unbelievable. Congratulations boys – you amazed everyone. Breakfast over, we said goodbye. Mary and Jean headed home and the rest of us piled into Adam's rental car bound for downtown Annapolis and the Naval Academy campus. 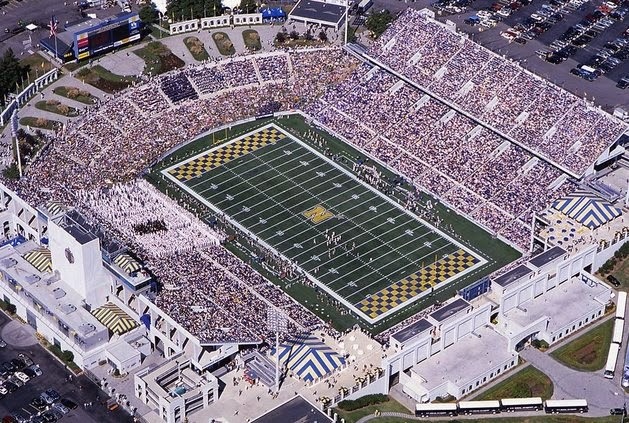 Annapolis, MD was founded in the year 1649. In the succeeding 365 years, there have been no improvements in parking conditions. 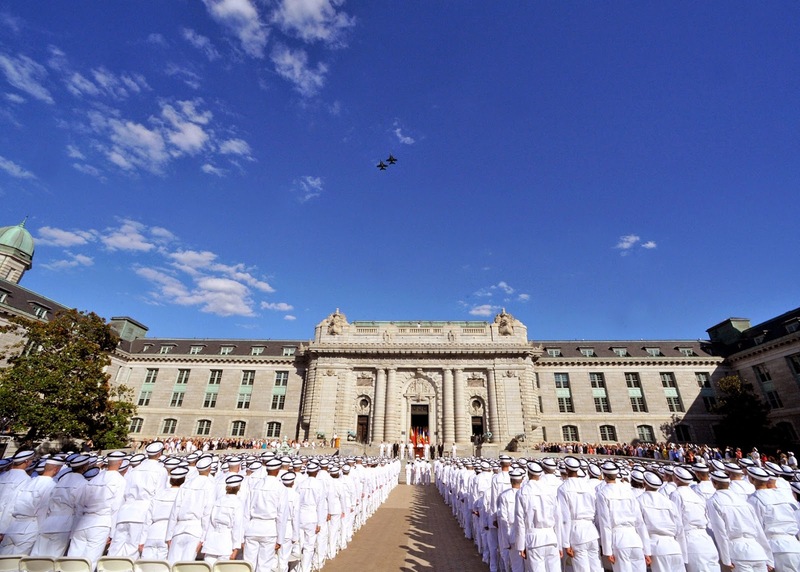 Dealing with a vehicle in downtown is a nightmare of epic proportions that continues into the grounds of the Naval Academy. We were striving to reach the chapel for the memorial service for members of the class of '99 who have died since their graduation. We decided to drop off Adam and family at the chapel while Michelle and I would try to park the car. We finally found a space barely big enough to shoehorn the car into and of course as far from the chapel as you could get. It would have been easier to grease the street and push the car in sideways. That done, we struck out for the chapel at a brisk pace in hopes of getting to see some of the memorial service. About halfway there disaster struck. With a loud sickening thud, Michelle was on the ground. Shattered sun glasses and gushing blood everywhere scared me to death and since she was face down, I couldn't see anything. A small crowd quickly gathered and a young Ensign called 911. (Thank you sir, whoever and wherever you are). Ambulance and police arrived and we convinced Michelle to go for treatment. The police took a lot of information and pictures. The culprit in this incident was a square of concrete sidewalk that had been lifted by a tree root. This was obviously not a new hazard. Off to Anne Arundel Medical Center – Michelle on a gurney in the back of the ambulance and I in the cab with the driver. After a pretty thorough going over in the ER, this was the final assessment. She suffered a small facial/skull cut on her left eyebrow. 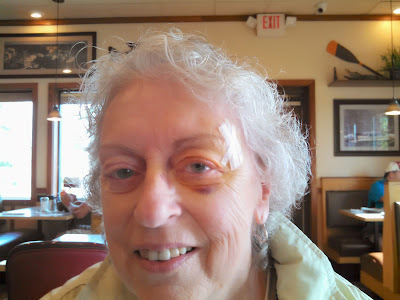 Sunglasses were destroyed but eyeglasses were just bent and gave her a real bruise around her eye socket. Heretofore unnoticed was injury to her left elbow caused by falling with her left arm in front of her. Over the days to come that became the more serious part of the whole incident. Worst of all was the fact that her jacket from the 2013 Maritime Province Caravan was covered with blood. It's all about priorities. It was a couple hours before I was able to reach Adam on his cell phone and update him on our situation. I convinced him that we were OK, that he should not interrupt his plans for the day, and that I would join him after I got Michelle back to the hotel. The hospital released Michelle and we took a cab back to the hotel then I continued back to the campus to join up with family. We connected at the Visitor's Center and while standing there the ambulance arrived with siren going responding to another call. While one paramedic went into the building to answer the call, the other two recognized me and came over to inquire about Michelle. I brought them up to date and they wished us well. I thanked them again for their excellent service. We spent the afternoon touring the campus, loading up on Navy logo stuff for the boys at the Mid store, and doing informal "meet and greets" with Adam's classmates as we encountered them. 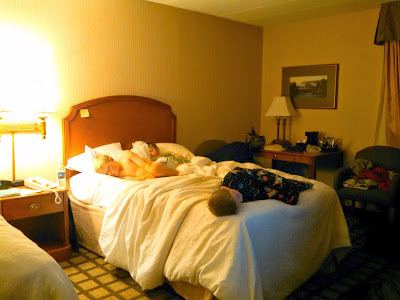 As evening approached, the boys were winding down and so was I, when we realized that the only key to the rental car was in Michelle's jacket pocket which was now at the hotel. Aw s@#$*! Dan Bessman, Adam's academy roommate and best man at his wedding, was there with a car. So the two of them made the trip back to the hotel to retrieve the car key, while the rest of us had a snack supper at the pizza shop in Dahlgren Hall. That seemed to take forever but I'm sure it was our exhausted imagination. Amy, the boys, and I made the long trek across campus to our parked rental car. It seemed ages ago that I parked that car. We headed for the hotel while Adam joined up with some of his classmates for reunion and reminiscing. What a day. Yes. It was a long day. Yesterday (Wednesday) was pack up day. After sending Adam and family on their way for a day of sight–seeing in Washington DC, we turned our attention to packing our stuff. We've been parked here for five months, so packing included a lot of acquired stuff. Seems like acquiring stuff is a human condition. By sundown, we had it under control and Thursday would be the normal Close–Up checklist. This morning I returned my trusty golf cart to the shop, we closed up our rig, hooked up the truck, and said goodbye to the few Workampers still here. On our way out, we stopped at the office to bid farewell to Bob and Becky Miller, the park managers, who have been our bosses for the past five months. I cannot put into words what fine people these two folks are. It has been a pleasure working for them. I wish them the best in years to come. Our travel today was due south. A short 169 miles which we accomplished in just under four hours. Pause a minute to look at the map and take a little geography lesson. We spent the summer in the Susquehana River Valley. Our trip south followed the river as far as Harrisburg. From there the river goes to the southeast and dumps into the Chesepeake Bay at Harve de Grace. The headwaters of the North Branch of the Susquehana River are in upstate New York, so the river bisects the Commonwealth of Pennsylvania and cuts through the state of Maryland. 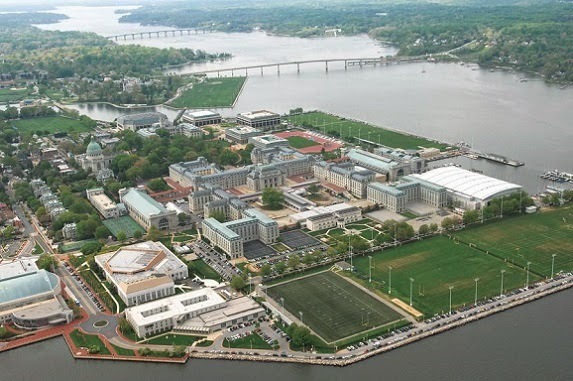 I told Adam he could put a kayak in to the water at Yogi at Shangri–La and paddle to the USNA marina. The Susquehanna River is a river located in the northeastern United States. At 464 miles (747 km) long, it is the longest river on the American east coast that drains into the Atlantic Ocean. With its watershed, it is the 16th-largest river in the United States, and the longest river in the continental United States without commercial boat traffic today. The nation's 16th-largest river by volume, the Susquehanna rises and flows through New York, Pennsylvania, and Maryland into the Chesapeake Bay. It forms from two main branches: the "North Branch", which rises in upstate New York and is regarded by federal mapmakers as the main branch, and the West Branch Susquehanna. The shorter West Branch, which rises in western Pennsylvania, joins the main stem of the Susquehanna near Northumberland in central Pennsylvania. 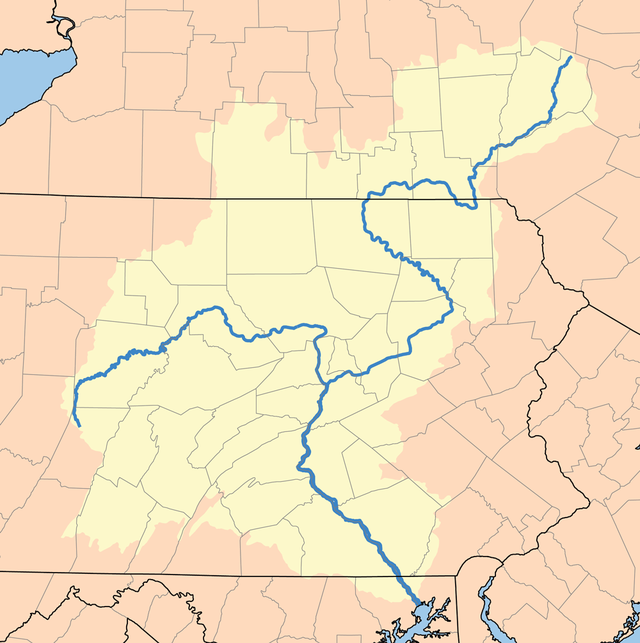 The river drains 27,500 square miles (71,000 km2), including nearly half of the land area of Pennsylvania. 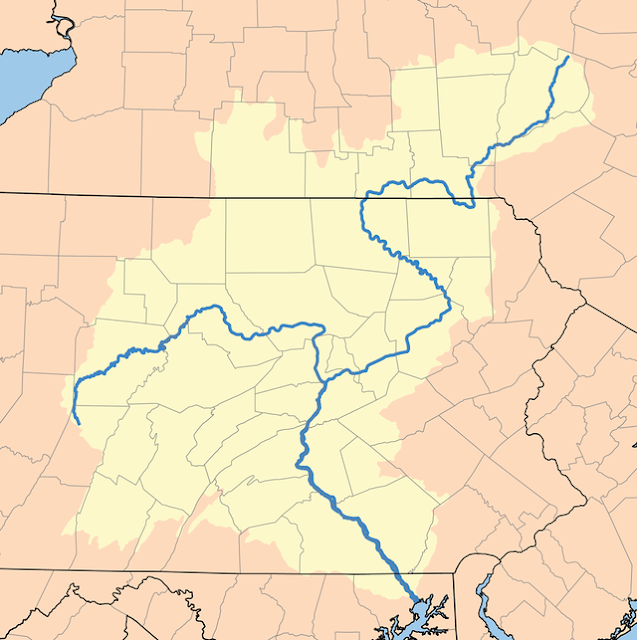 The drainage basin (watershed) includes portions of the Allegheny Plateau region of the Appalachian Mountains, cutting through a succession of water gaps in a broad zigzag course to flow across the rural heartland of southeastern Pennsylvania and northeastern Maryland in the lateral near-parallel array of mountain ridges. The river empties into the northern end of the Chesapeake Bay at Havre de Grace, Maryland, providing half of the Bay's freshwater inflow. The Chesapeake Bay is the ria of the Susquehanna. Ria means 'a long narrow inlet of the seacoast, being a former valley that was submerged by a rise in the level of the sea'. Rising as the outlet of Otsego Lake in Cooperstown, New York, the north branch of the river runs west-southwest through dairy country, receiving the Unadilla River at Sidney and the Chenango in downtown Binghamton. It dips south into Pennsylvania briefly to turn sharply at Susquehanna Depot north back into New York. At Athens Township (just south of Waverly, New York) in northern Pennsylvania, just across the New York state line, it receives the Chemung from the northwest. It makes a right-angle curve between Sayre and Towanda to cut through the Endless Mountains in the Allegheny Plateau of Pennsylvania. 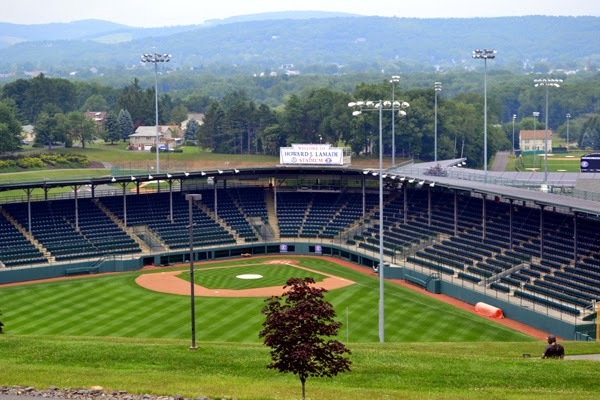 It receives the Lackawanna River southwest of Scranton and turns sharply to the southwest, flowing through the former anthracite industrial heartland in the mountain ridges of northeastern Pennsylvania, past Wilkes-Barre, Nanticoke, Shickshinny, Berwick, Bloomsburg, and Danville. The origin of the West Branch is near Northern Cambria, Pennsylvania. It travels northeasterly through Curwensville (where the river is dammed to form a lake), through Clearfield, Pennsylvania. The West Branch turns to the southeast and passes through Lock Haven and Williamsport before turning south. The North Branch joins the West Branch from the northwest at Northumberland, just above Sunbury. Downstream from the confluence of its branches, the river flows south past Selinsgrove, where it is joined by its Penns Creek tributary, and cuts through a water gap at the western end of Mahantongo Mountain. It receives the Juniata River from the northwest at Duncannon, then passes through its last water gap through Blue Mountain, just northwest of Harrisburg. Downtown Harrisburg developed on both sides of the river, which is nearly a mile wide here. Harrisburg is the largest city located on the lower river, which flows southeast across South Central Pennsylvania, forming the border between York and Lancaster counties, and receiving Swatara Creek from the northeast. 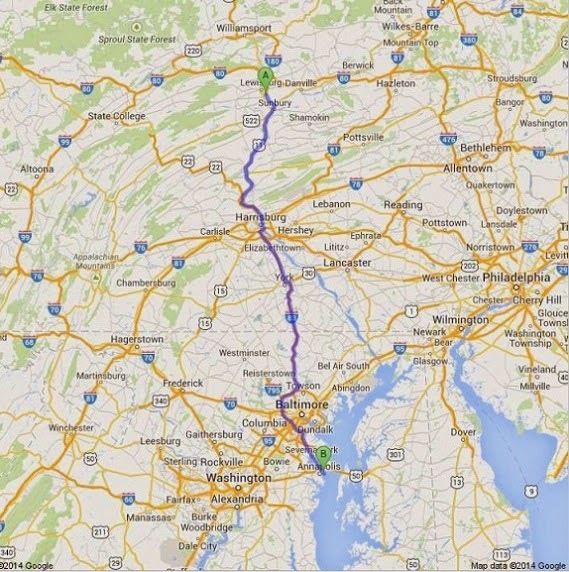 It crosses into northern Maryland approximately 30 miles (48 km) northeast of Baltimore and is joined by Octoraro Creek. The river enters the northern end of the Chesapeake Bay at Havre de Grace. The USNA Support Facility is on the eastern bank of the Severn River just upstream from the mouth at the Chesapeake Bay. 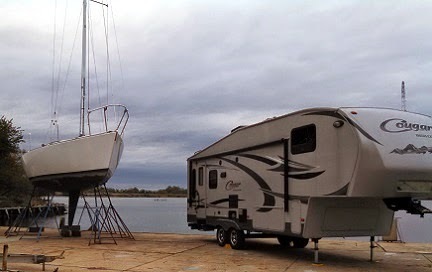 The marina there offered us a parking place for our unoccupied rig. There was also an RV Park nearby. Since our activities for this weekend are family oriented, we chose to park our rig at the marina and join Adam and family at their hotel. We were settled into the marina parking place by 1500 hrs (3PM). We disconnected the truck and headed off to join Adam at his hotel. The day was a success. 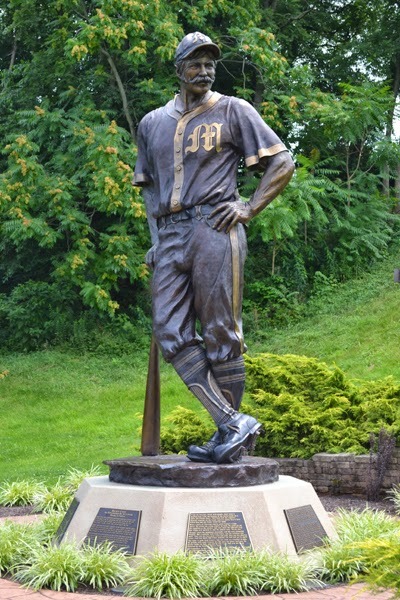 While visiting Lamade Stadium, we came upon the statue of Casey At The Bat. 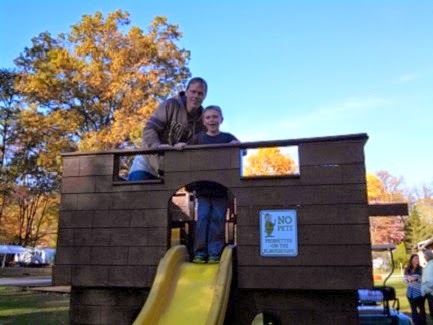 Our three grandsons, Andrew, Joshua, and Benjamin, have no connection or recognition of the story. Casey is a story from a different era. I got to thinking about the once famous poem and resolved to do some research and refresh my memory on this piece of Americana. 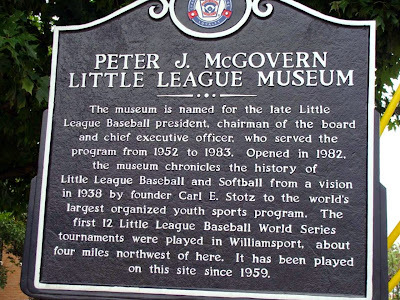 Maybe three young baseball fans will get a kick out of this bit of baseball history. Everything that follows in this post comes from Wikipedia. None of it is my work. I'll take credit only for a little bit of arranging. A baseball team from the fictional town of Mudville (implied to be the home team) is losing by two runs in their last inning. Both the team and its fans (a crowd of 5,000, according to the poem) believe they can win if Mighty Casey, Mudville's star player, gets up to bat. However, Casey is scheduled to be the fifth batter of the inning, and the first two batters (Cooney and Barrows) fail to get on base. The next two batters (Flynn and Jimmy Blake) are perceived to be weak hitters with little chance of reaching base to allow Casey a chance to bat. Surprisingly, Flynn hits a single, and Blake follows with a double that allows Flynn to reach third base. Both runners are now in scoring position and Casey represents the potential winning run. Casey is so sure of his abilities that he does not swing at the first two pitches, both called strikes. 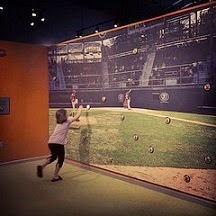 On the last pitch, the overconfident Casey strikes out swinging, ending the game and sending the crowd home unhappy. The text is filled with references to baseball as it was in 1888, which in many ways is not far removed from today's version. As a work, the poem encapsulates much of the appeal of baseball, including the involvement of the crowd. 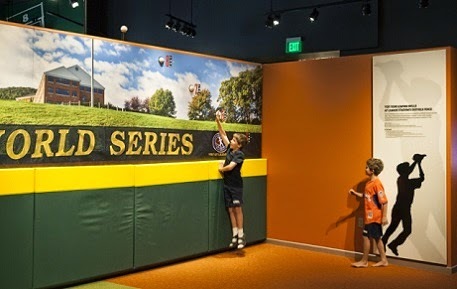 It also has a fair amount of baseball jargon that can pose challenges for the uninitiated. This is the complete poem as it originally appeared in The San Francisco Examiner, with commentary. After publication, various versions with minor changes were produced. They'd put up even money, now, with Casey at the bat. "No one imagines that 'Casey' is great in the sense that the poetry of Shakespeare or Dante is great; a comic ballad obviously must be judged by different standards. One doesn’t criticize a slice of superb apple pie because it fails to taste like crepes suzette. Thayer was only trying to write a comic ballad, with clanking rhymes and a vigorous beat, that could be read quickly, understood at once, and laughed at by any newspaper reader who knew baseball. Somehow, in harmony with the curious laws of humor and popular taste, he managed to produce the nation’s best-known piece of comic verse—a ballad that began a native legend as colorful and permanent as that of Johnny Appleseed or Paul Bunyan." All three of our grandsons – Andrew, Joshua, Benjamin – are into baseball. Joshua is the most intent. Andrew second, his first love is still soccer. Ben is still a bit young. 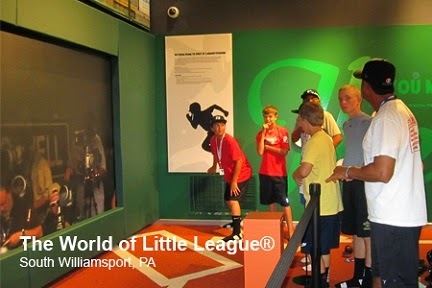 Joshua and Andrew play on real "Little League" teams but I don't think they fully comprehend the scope of that name and the meaning of the Little League World Series. Michelle and I attended one of the World Series games in person back in June. The boys watched some of those games on TV at home in Denver. That said, we eagerly anticipated today's adventure. 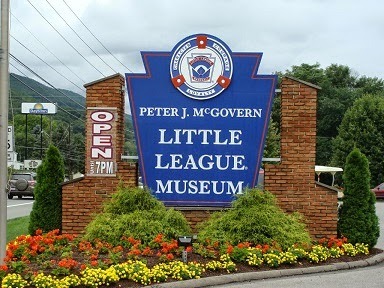 The World of Little League complex is about twenty miles north of our work site at Yogi at Shangri–La RV Park. After breakfast, we all piled into the car and headed off to South Williamsport. The parking lot off the highway is very small and you cannot see the stadium as you park and exit your car. We pulled in and the boys noisily piled out of the car. As they walked to the rail and saw the stadium for the first time, there was a collective gasp of awe and silence. The stadium is open and walkable, so Adam, Amy, and the boys spent an hour wandering through the facility. 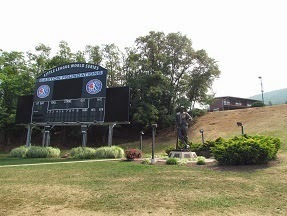 They paused for pictures near the scoreboard with the statue of "Casey at the Bat"
That got me to thinking about the once famous poem and I resolved to do some research and refresh my memory on this bit of Americana. 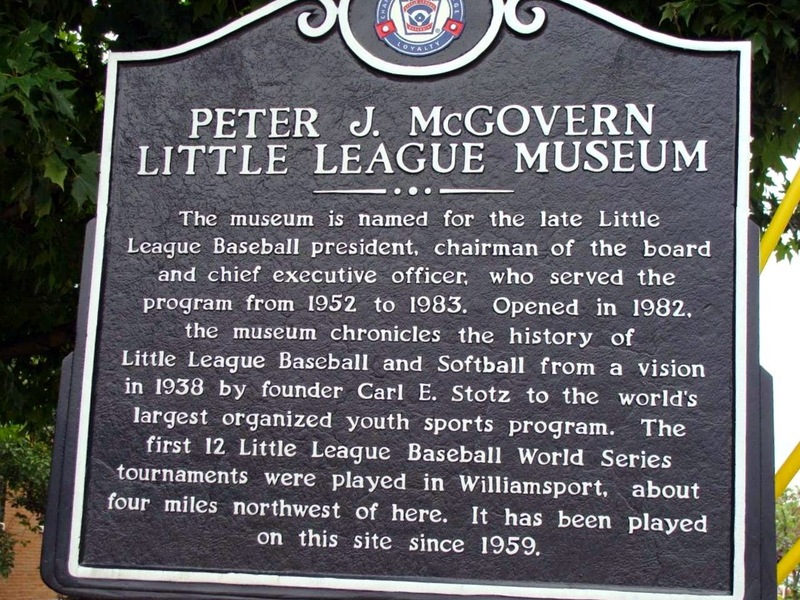 Little League Baseball was founded in 1938 by Carl E. Stotz, so a picture at his statue seemed appropriate. 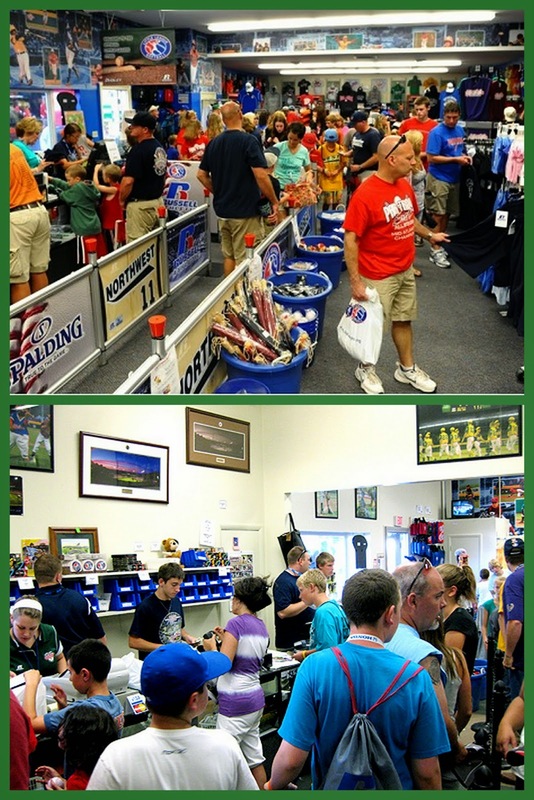 From the stadium, we moved the couple hundred yards down the highway to the museum and store. I enjoy museums and I make a real effort to learn something at every one I visit. Here I was impressed with how much research has been done by the Little League organization to "resize" the game to fit young people and to make the game safer. 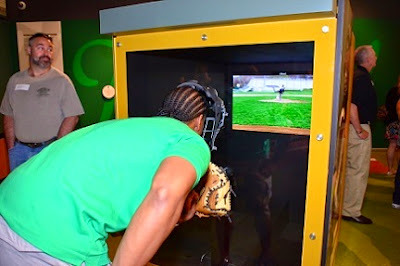 I was also impressed with the exhibit of famous people from all fields of endeavor who played Little League Baseball in their youth. As with all museums – "Exit through the Gift Shop". We spent some time and bucks here. It was a good day, enjoyed by all. 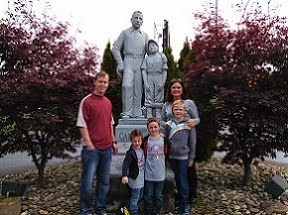 I'm happy we got to share this bit of American culture that lays in north–central Pennsylvania with our family. In our current lifestyle we don't get to see our grandkids very often. Maybe that's a blessing that keeps the relationship fresh. I don't think I could stand the energy level that surrounds three growing boys on a continuing basis. Yesterday was their travel day, so they were overflowing with unburned calories. Today was a day to get rid of most of it. We spent a couple hours in Lewisburg. Michelle and Amy did a laundry, then took the boys to Lewisburg Area Recreation Park; Adam and I went to Barnes and Noble for a good internet signal. For lunch we used up a couple Subway gift cards and had subs at the cabin. In the afternoon, a couple hours at the playground burned off some more enegry. I enjoyed watching how three boys can make a baseball game with only three people. Mom and Dad jumped in to help now and then. ... and we needed one more campfire. Andrew is now an expert at building a campfire. Joshua and Benjamin also advanced their skills. All three were very respectful of fire and careful in handling it. Late October and winter is coming for sure. The rain and wind of the past few days has turned the beautiful fall foliage into a blanket of wet soggy leaves on the ground. 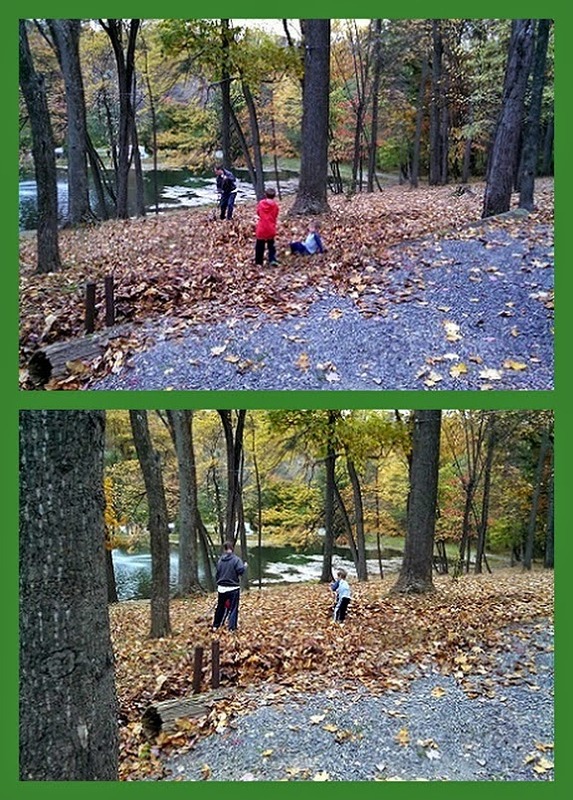 Campground workers are getting serious about the chores to batten this place down for the winter. Snowbird WorKampers have been leaving and this morning Lee and Grace Kegresse hit the road for Florida followed shortly by Herb and Pat Myers: also headed to Florida but by way of Toledo,OH. Now there are only four left. In the next few days we all will be gone. Our last work day was last Friday. One last hurrah before we leave. This afternoon, Adam, Amy, and the boys arrived for a couple days. 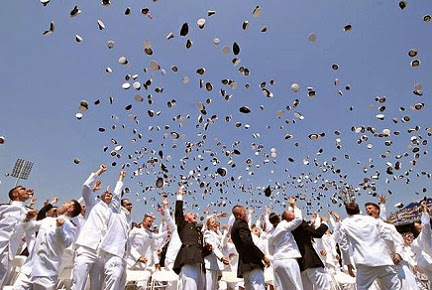 They are going to Annapolis for Adam's 15 year class reunion. They flew from Denver to BWI and drove here (about 163 miles). The boys exploded out of the car overflowing with bottled up energy from hours stuck in airplane and car seats. 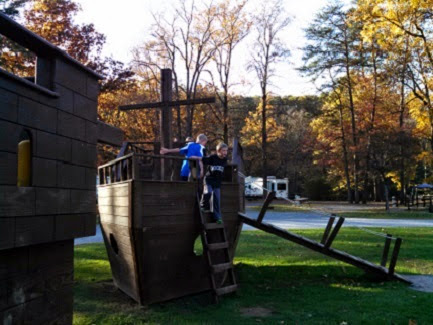 It only took a few seconds to find the playground and begin to unwind. 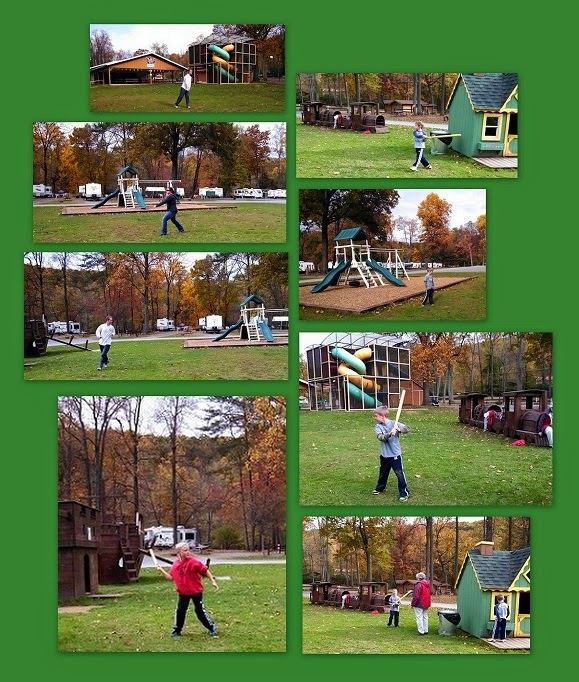 After a bit we took them to the office to meet Becky and Bob and then to their cabin which Ted and Penny had carefully decorated with some Halloween surprises. 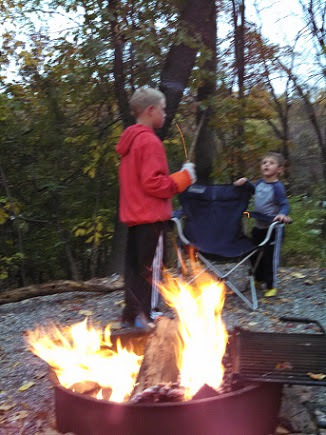 The boys helped Gramps build a campfire and for supper we roasted hot dogs and then made smores. The weather was clear and cool all day and with nightfall it got downright cold. Grandma was prepared though. She had bought a Yogi hoodie for each of the boys. 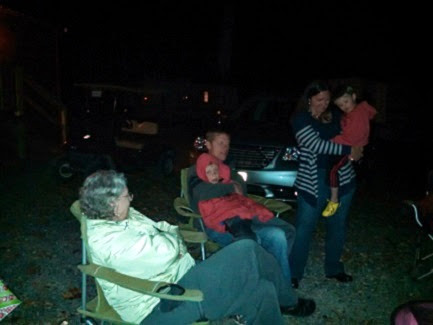 So they were comfortable as we sat around the campfire for a short while before bedtime. It was a "goodbye to some, hello to others" kind of day. At our stix and brix house in Ohio, I had a 20 ft flag pole, mounted in concrete near the street end of our lot. It was a substantial pole; strong enough to stand up to a stiff wind and tall enough to let Old Glory catch the breeze. I was proud of that pole. It gave me a good feeling to see our flag flying when it came into view as I rounded the curve approaching our house. Since we have been RVing, I have come to miss that pole and the flag, and have been looking for an alternative. I have my collection of flags with me; I only need the pole. 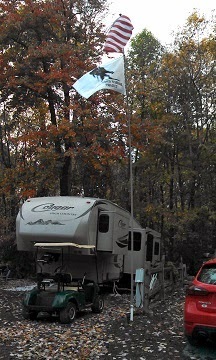 The popular flag setups for RVs don't work for me. Since we are a fifth wheel, usually in a back-in situation, the ladder attachment scheme puts the flag pole in the woods instead of out front. The 'under the wheel' setup doesn't work because my wheels are under the slide–out. Patience won out and I eventually found what I was looking for. 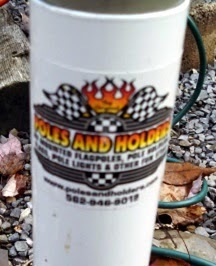 Poles and Holders sells a free standing 20 foot flag pole (Model PNH-22) that collapses to less than four feet and weighs only four pounds. Separately they sell a ground mount (Model GM-22) to hold the pole. I was skeptical of the ground mount because their descriptive literature and pictures are inadequate and I did not get a good feeling about its strength to hold the pole in a strong wind or its ability to withstand repeated hammering into the ground. However, I bit the bullet and bought the pole and ground mount; relying on being able to return the product if it proved unsatisfactory. The entire package – pole, ground mount, and shipping was $98. So far I am satisfied, although I am still waiting for a strong wind to test it. Changing subjects from flag poles to flying flags. Recently, while out and about, I was surprised to see flags at half–staff. I didn't know why and that got me to thinking about how to get an advanced warning on when to fly the flag at half–staff. When in doubt 'google it'. I did and got the official dates for when the flag should be flown at half–staff. I loaded those dates in my calendar with an email warning the day before. I also came across this liitle widget. Click on the picture and get the code to put in your blog or website. It will show you every day if the day is a full–staff day or a half–staff day. It's kind of cool. The only problem is that it only tells you about today, not tomorrow. So it does not provide any advanced warning.